When blogging you can get a bit caught up about what happens now, in the recent past. It’s why many of the awards get given to those who achieve late in the year, how lists are skewed towards the modern era, and not the old. It seems a long time ago now, but the busiest day on the blog this year, outside of the infamous List, and more of that later in the year, was in the immediate aftermath of the World T20 Final. I sort of think of that final over as a “Sliding Doors” moment. To guess the true significance, from my perspective, of it, is to hypothesise on what might have been. I think the key post that frames the impact I thought might be coming our way is the one I wrote on 26 January, and called Schism. It aches me, genuinely, that as a result of actions in 2014 England supporters, the ones we encounter on social media, split down the middle. Team Cook (ECB) vs Team KP (Outside Cricket). The two sides entrenched, in many ways not seeing each others point of view, but letting the frustration of the other side refusing to “buckle” reinforce matters more. I try to see things from the anti-KP brigade, and I just can’t. I accept that. I write about it. How difficult it is to think that people can take a load of media-assembled points and run them as fact without doing the thinking themselves. About how it is evident, to me, that the ECB leaked like my old shed roof and yet this was acceptable because it was getting the man. I try to explain this pull, this wretched feeling that something went so disgustingly wrong, that there were people who would rather side with the authorities than with a maverick, not seeing the bigger picture. The Ashes in 2015 brought out the worst in the pro-ECB masses. It put us in our place. We were there only to be told to toe the line, get in with England and Cook, and yet people still kept on keeping on. There was still a tough core of people on here who would not get over the issues, not move on, not get into line. Maybe it brought out the worst in us. A peevish refusal to accept the position, almost that to give up would be to betray what we had putout there in the previous 18 months. Over the preceding winter to the T20 competition KP started to hit form in the Big Bash. While certain people talked up a potential recall to the England, we all deep down knew it would never happen. Too many egos at play, too much water under the bridge. But it still rankled. A brilliant T20 performer left kicking his heels, undoubtedly good enough to get in the team, but kept out by a concept, a grudge, and stupidity. What was so important about the loss in the World T20 Final is what it prevented from happening. It’s almost sacrilege to say it was a good thing England lost, and I can’t quite go that far. Was I crushingly disappointed? No. And I like this ODI/T20 team because it doesn’t, or at least didn’t, carry the baggage the test team did. But it was the way the press, the acolytes, the hangers-on were lining up what they would say if the victory had been sealed. Within a year Comma would be vindicated, feted as a genius, a man who turned water into wine, a man who could do little wrong. Look at us 8 months on, and see where we are now – a bedraggled test unit, at the end of their tether – and see how the climate has changed. Then there would be the ample opportunities to stick the knife into Kevin Pietersen – don’t they always – and us. People like us. Those who despise the ECB. Those who had excoriated a supine, pliant media for their obsequiousness. We would have seen the Ashes 2015 aftermath rerun – a time of vile abuse, of crass stupidity, and a downright unpleasant time to be blogging. It really ceased being fun. 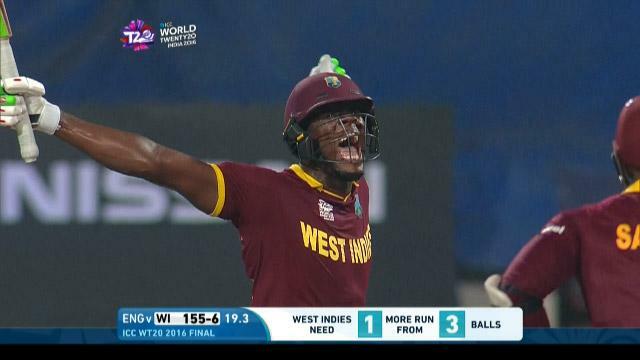 Carlos Brathwaite also brought joy to the West Indies. Some of the players in that team it is very fair to say do not command respect. Gayle’s behaviour in Australia last winter being the most prominent, but Dwayne Bravo and Marlon Samuels aren’t exactly angels, and as for ‘Dre Russ, we are still awaiting his drug hearing. But there’s something about a West Indies success that just rouses you. Well it does me. It’s not being a hipster, but more in touch with my youth and their all conquering team. 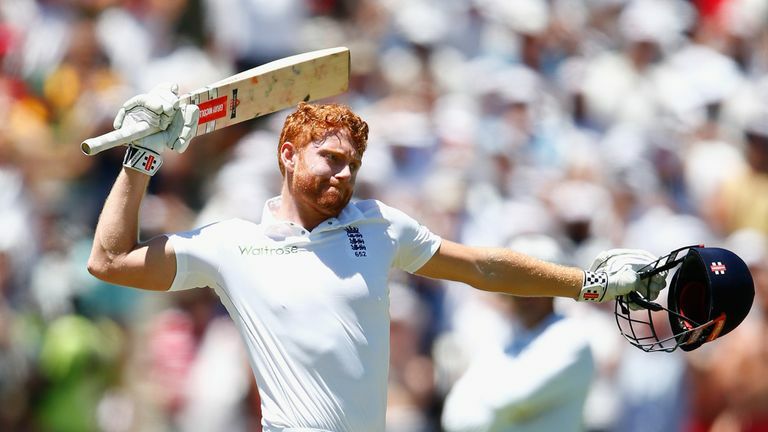 Those glimpses are more fleeting, their cricket more fragile – that word again – and thus unrestrained joy, especially at the expense of a cocky, arrogant foe (and England are that, whether we like it or not, we are not well liked in international circles) could be understood. Newman went ballistic at it, acting like a child, telling them off for celebrating in front of us, being mean spirited, and, worst of all, adding on to their U-19 success on the back of a Mankading, evidence of not playing the game in the right way. That over changed a lot, and in many ways the blogging landscape has calmed down a lot since there. There’s not the visceral anger there once seemed to be. The usual suspects still have their ways of cheesing me off, but there’s not that need to fight as much. I think an England win might have exacerbated it. Not that that is at all important, and this isn’t meant to be a (totally) self-centred piece, but the anti-KP/ ECB fanboy/girl mob got to feel real pain, even if it was fleeting, even if it was in a tournament we all thought we had no chance in. It may have turned a cricket team’s fate, as their test team now looks a little better, but with still a long way to go. It was a cracking tournament and England played very well, and we can build confidence upon that display, in very testing conditions. But in the end, one of the most amazing finishes you are likely to see impacted very widely, and possibly, just possibly, the corner was turned on a number of fronts, big and small. It’s that time of year again. December brings the Dmitris. Like Wisden Cricketers of the Year but on a shoestring budget. Like Sports Personality of the Year but without a gala occasion and no Andy Murray. In the past two years they have been awarded to people, groups of people, numbers, teams etc. They aren’t all about merit, but significance to the blog, and major events. I’m not limiting them in number, but year 1 had 10, year 2 had 7 (I think). The first Dmitri this year is awarded to a journalist who I think has contributed to matters discussed in this blog, and who I know a number of you regard highly. It is for Tim Wigmore, who finished a very close second in the Poll for favourite journalist. OK, let’s get something out of the way. I’ve met Tim a couple of times, and also spoken to him a little off line, but not a lot. So this is most definitely not an award because I am in any way friendly with him. However, my votes, which count for more in the poll (because I’m an authoritarian dictator) did propel him over long-time leader Jarrod Kimber into the top spot for a while before a usual suspect had a late rally. Jarrod did not make my top three this year, although that’s not any major reflection on him – he did not make Death of a Gentleman this year after all! So why Tim? Well, first of all George and Jarrod have won a Dmitri and so they can’t win it again! The poll is separate, but influential in the Dmitri awards. He was by far the highest scorer of those that have not got one. There are many reasons why. What we see from Tim is pure grunt work. He’s not a test match reporter like his more glamorous peers, but he’s very much an international cricket man. His work on the Associate nations, especially in The Cricket Paper, is absolutely top notch, but it isn’t confined to that – his work for cricinfo and occasional forays into the national press resonate. He attacks his subjects with brilliant passion, has a wide range to his brief, and importantly to us on here, he goes on the attack when he thinks the game is going wrong, and because he so transparently believes in his position. I think he’s the best out there at what he does. The Editorial board were discussing this at our meeting on 22 November, and compared his output to others in the up and coming group. Compared to Chris Stocks and Will McPherson, we thought Tim had the better pieces, the more tricky and meaty subjects, and yes, we probably had less cause to be annoyed at the pieces than with the other two. I wish Tim all the best going forward, tackling the Associate agenda with the gusto he’s shown so far, doing the grind on the county scene, and hopefully getting the big break if he so wants it. Let’s put it this way, without his input into the Cricket Paper, we’d be left with a lot of Stocks and Pringle. Good for copy on the blog, but not on my blood pressure. So the first Dmitri of 2016 goes to Tim, for the slot reserved for our favourite journos, and joins Dobell and Kimber/Collins in the Dmitri Award Hall of Fame. As great an honour as there is in the game I’m sure! But it’s a clear message from us that Tim should keep on keeping on. The Final poll results will follow in the next few days.